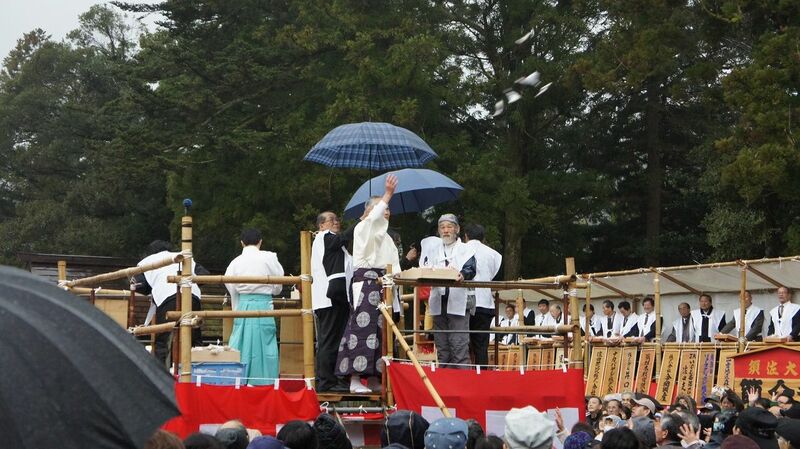 Newspaper estimates three thousand people gathered at Susa’s Setsubunsai festival despite rain. 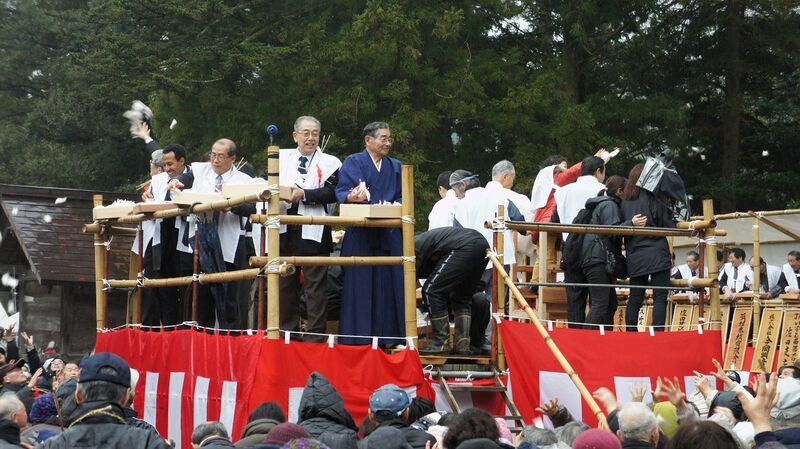 On the 3rd of February the annual tradition of Setsubun-sai festival was held at Susa Jinja shrine. 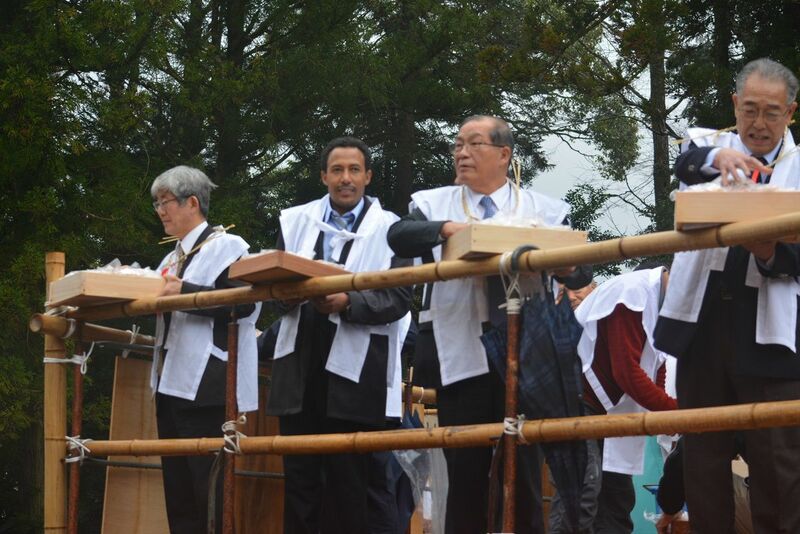 As usual Somin Shorai’s Chinowa rings were given to the visiting worshippers (see information on last year’s blog), and more than 600 kg of lucky bags containing roasted soy beans and mochi cakes were distributed by the invited VIPs. 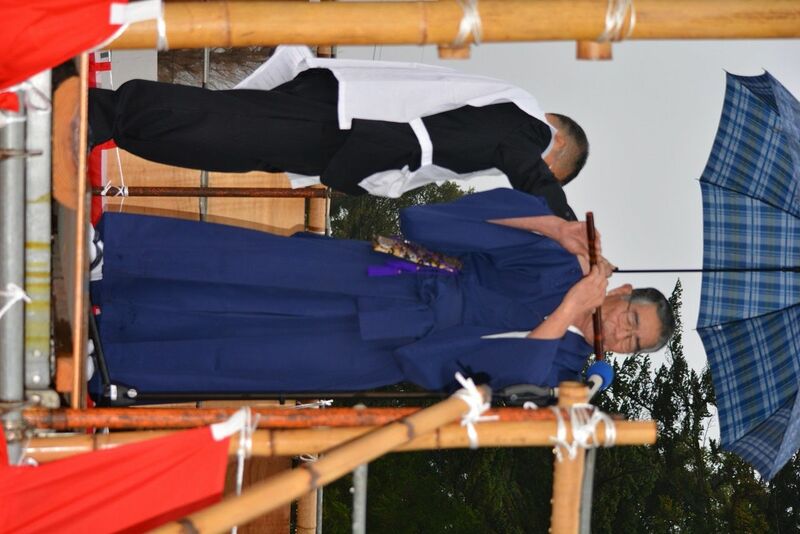 On our website his music piece can be heard by clicking the music tab on left top of the home screen. 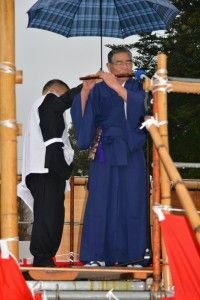 He is playing his replica ‘Tsuchibue’ earthenware flute dating from the Yayoi Period (300 BC – 300 AD). 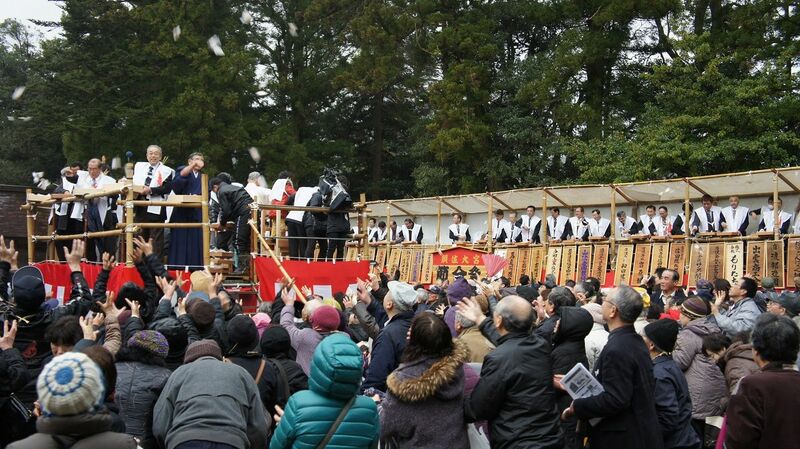 He produces Kagura flutes, various other flutes at his オンライン カジノ workshop in Hikawa, Izumo City. He has performed outside Japan several times. 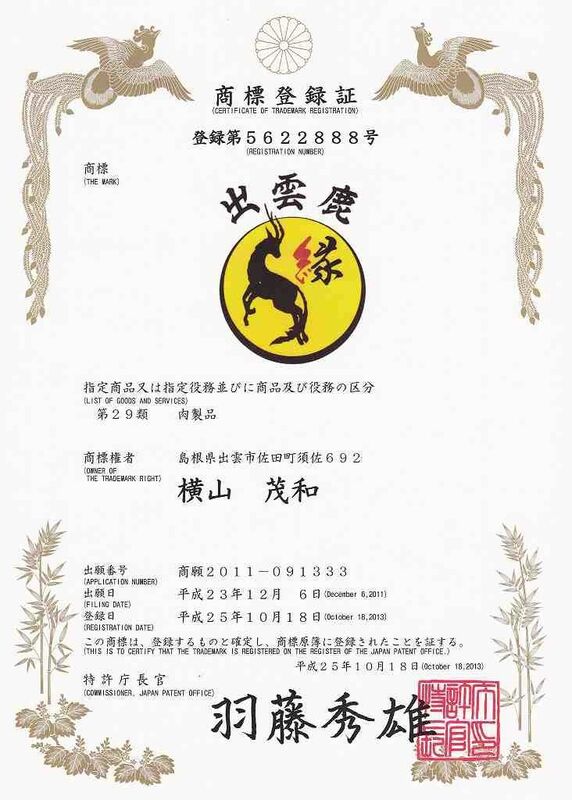 We will upload a separate blog about Tatsuo Hino shortly. This year for the first time the three generations of Susa priest clan participated the tradition, the head priest Susa, his son and grandson. 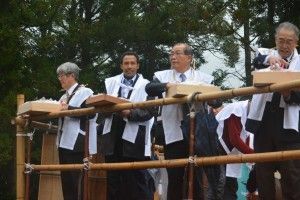 reason at Susa Jinja they don’t shout ‘Oniwah-soto’ (evil out). 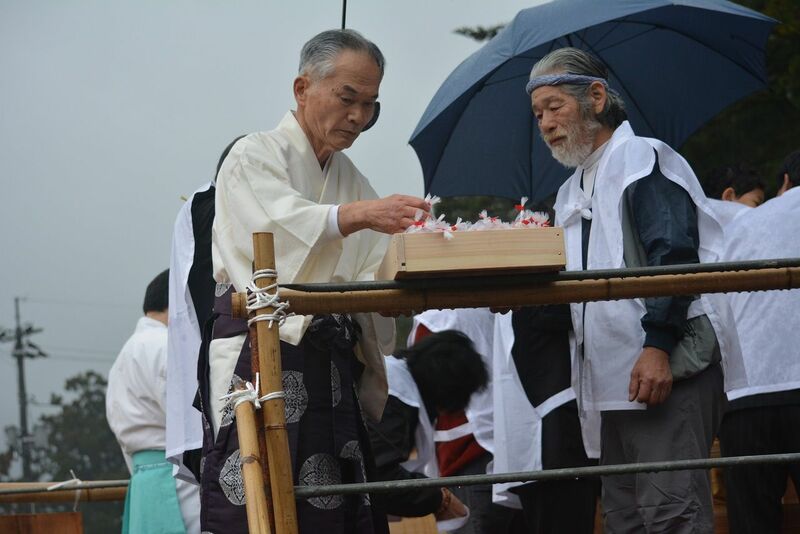 This ritual is to drive evil out of the worshippers’ houses and bring happiness and good fortune instead. 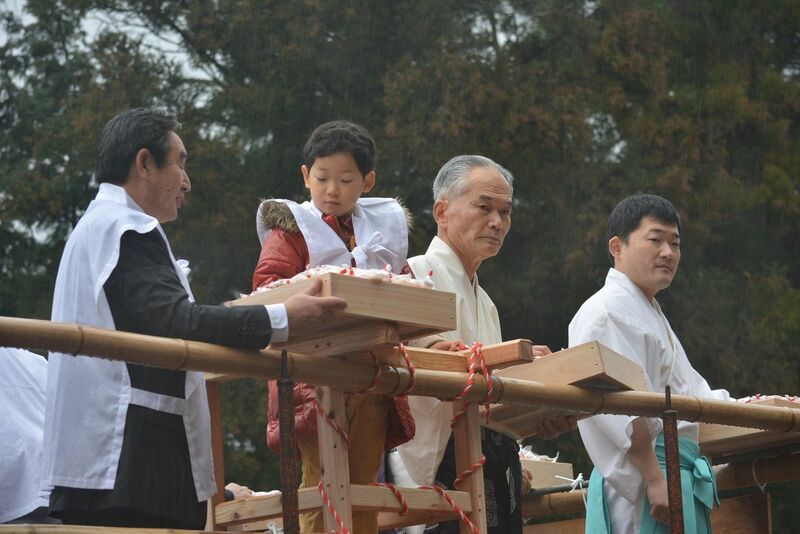 Head Priest Taketoshi Susa is between his son Negi Priest Takehisa Susa and his grandson Takenori Susa. 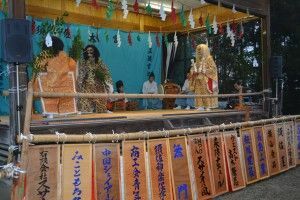 Part of their names ‘Take 建’ is the title associated with Japanese mythology hence traditionally used in priests’ given names. 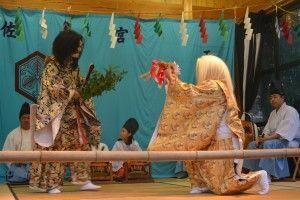 Children from the two local nursery schools who go up to the infant school in April are traditionally invited to participate. 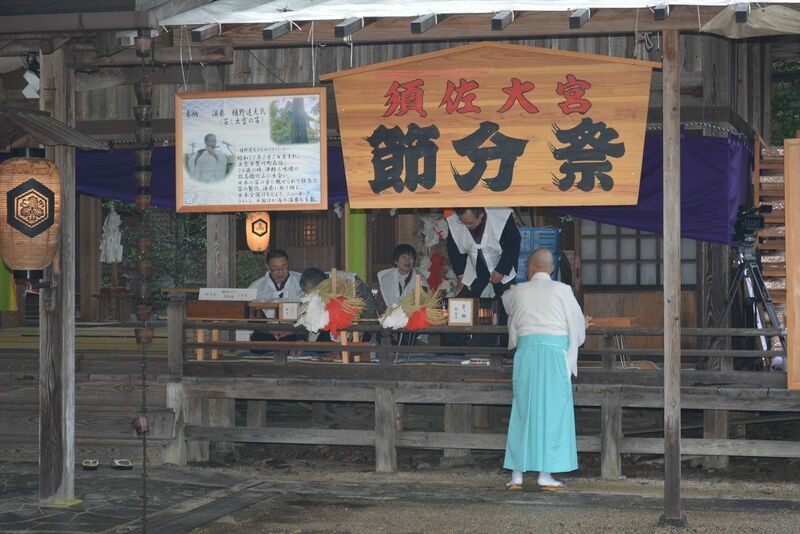 Takenori is six years old and his nursery class mates are also throwing bags from the opposite Kaguraden dance hall. 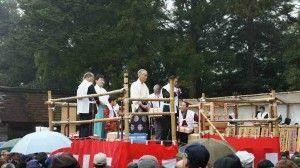 Our local City Councilor Itagaki, a member of the shrine committee, is helping young Takenori who will be the next generation priest. 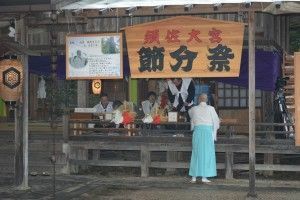 You can also see Kazuo Ohshima, with headband, who produces the Chinowa rings each year. 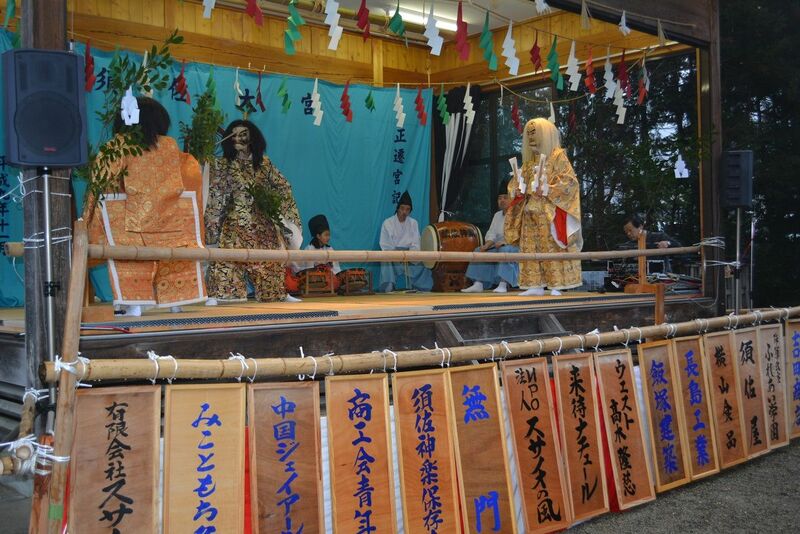 As usual, Somin Shorai Kagura dance was performed by a local group belonging to Susa Jinja shrine. 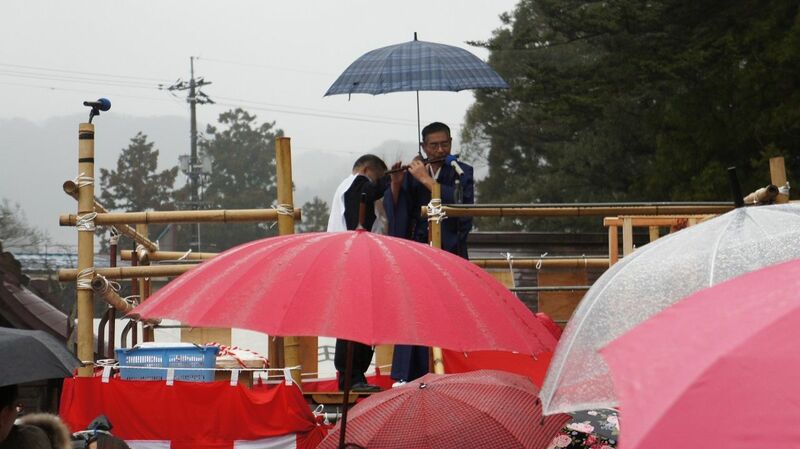 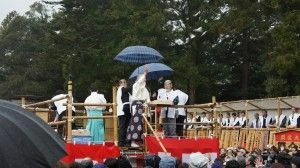 Kumano Taisha Grand Shrine also estimated three thousand worshippers gathered, Shimane Governor Mizoguchi and Matsue City Mayor Matsuura among other VIPs distributed ten thousand bags. 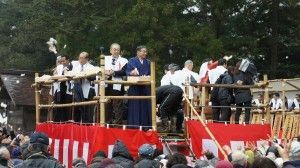 At Izumo Taisha Grand Shrine’s Kitajima shrine Head Priest Kitajima gave Setsubun-sai prayers for his Izumo-kyo followers, an estimated ten thousand attended.